The pattern is made from one simple block with two variations, light background & medium to dark background. It is very Pinwheel friendly, so you do not have to cut as much. We used the Pansy Noir pinwheel and fabric from the Pansy Noir line. This quilt can be made in lap,throw,twin, queen or king size. 10 different prints--pinwheels work well for these. Yardage is based on at least 40" wide of workable fabric. In addition to the materials shown for the size of quilt you are making, you will need your pattern, thread, and your Basic Supply List. 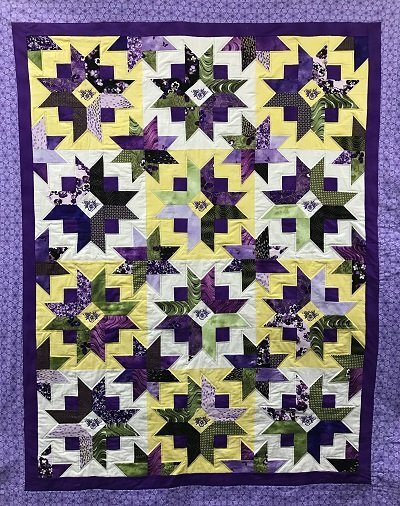 If you are not using pinwheels for the 2-1/2" strips, you will need to have your fabrics cut into strips 2 1/2" wide and the full width of the fabrics, before you come to class. Materials Included: Take 15% off all your class supplies. Requirements: Please precut your 2-1/2" strips if you are not using pinwheels.